"Very festive for the Easter holiday! 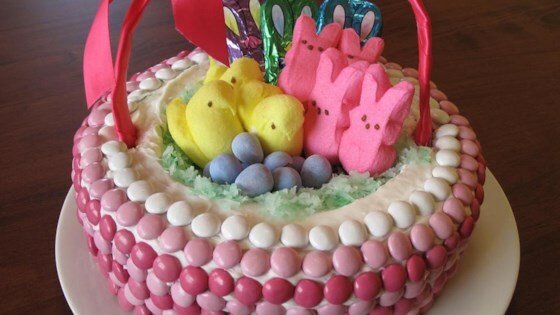 Instead of using the candy to decorate the basket, I've also used milk chocolate icing or colored the vanilla icing to match the handle then used a fork to gently rake a basket type woven look into the sides of the cake." Huge hit at Easter. Everyone loved it! And they were so amazed I did it myself. It was great! Thanks for the great idea!